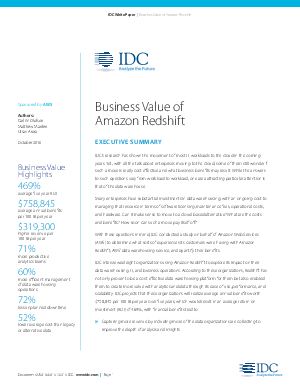 IDC’s research has shown the movement of most IT workloads to the cloud in the coming years. Yet, with all the talk about enterprises moving to the cloud, some of them still wonder if such a move is really cost effective and what business benefits may result. While the answers to such questions vary from workload to workload, one area attracting particular attention is that of the data warehouse. Many enterprises have substantial investments in data warehousing, with an ongoing cost to managing that resource in terms of software licensing, maintenance fees, operational costs, and hardware. Can it make sense to move to a cloud-based alternative? What are the costs and benefits? How soon can such a move pay itself off?